PARIS (Bloomberg) -- Delphi agreed to buy the HellermannTyton Group for 1.07 billion pounds ($1.7 billion) to add cabling gear used in cars. HellermannTyton, a UK supplier, manufactures ties, insulation and protection systems for cables in cars. The acquisition will help Delphi capitalize on growing demand for cars that connect to the Internet, mobile phones and other devices, Delphi said. "With consumers now demanding more connectivity in their vehicles, electrical architecture is the enabler to that added vehicle content," Delphi CEO Kevin Clark said in a statement today. Delphi also said it bought a maker of automated-driving software and took a stake in a company whose technology helps cars avoid objects. "Delphi continues to be focused on the car of the future," said Chris McNally, an analyst at Evercore ISI in London. "It's leading this charge into the connected cars space." Delphi is based in Gillingham, England, and run from Detroit. The company moved its domicile to the UK, where corporate tax rates are lower, in the wake of the U.S. government's 2009 bailout of the auto industry. HellermannTyton traces its roots to manufacturers founded in Germany and the UK in the 1930s. Doughty Hanson & Co., a UK private-equity firm, bought HellermannTyton in 2006, took it public in 2013 and sold its remaining stake last year. Delphi said it plans to complete the HellermannTyton deal late in the fourth quarter. The purchase also allows Delphi to expand into products for other industries, such as aerospace, defense, alternative energy and mass transit, Clark said. Bankers from Goldman Sachs Group and JPMorgan Chase & Co. advised HellermannTyton on the sale, while Barclays Plc. advised Delphi. HellermannTyton was valued at about 14.7 times last year's earnings before interest, tax, depreciation and amortization, the companies said. Separately, Delphi said its second-quarter net income rose but revenue fell as a stronger dollar hurt overseas results. 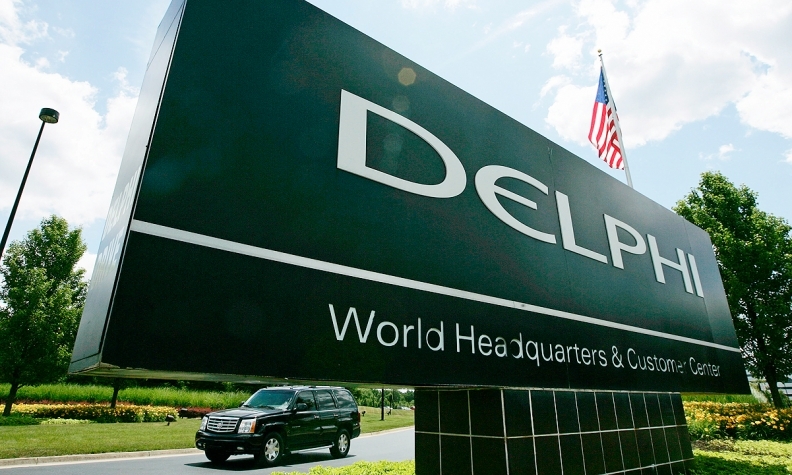 Delphi earned $667 million on sales of $3.86 billion in the second quarter. Net income included an after-tax gain of $285 million on the sale of its Thermal Systems business to German supplier Mahle. A year earlier, it posted net income of $406 million. Revenue fell 5 percent from $4.06 billion a year ago, due largely to unfavorable currency exchange rates, the company said. Delphi said it had sales growth in the quarter of 8 percent in Asia, 5 percent in North America and 4 percent in Europe, partly offset by a 15 percent decline in South America. Delphi also said today it bought Ottomatika, a maker of automated driving software, and made an investment in Quanergy, a company that develops light detection and ranging scanners, technology that enables cars to detect objects and execute digital mapping, surface modeling and distant imaging. Those deals will bolster Delphi's advanced driver-assistance system applications and may help speed the adoption of automated vehicles, the company said. The component maker also made a minority investment in Tula Technology, a maker of engine-control software that can increase fuel efficiency and cut emissions. Delphi agreed to sell its reception-systems business, which consists of automotive antennas and in-vehicle TV tuners, to Northeast Industries Group Corp., a Chinese automotive supplier. Delphi expects to complete the sale in the third quarter, subject to regulatory approval, it said. Financial terms weren't disclosed for any of the deals other than HellermannTyton.